Honors College students are among those with priority registration privileges and should receive a scheduling time beginning on Tuesday, April 2. If you do not receive a scheduling time close to April 2, contact Kevin Berezansky at kevinb@iup.edu. CHC students should schedule a meeting shortly following spring break with their advisor to discuss scheduling for the fall 2019 semester. You must meet with your advisor to receive a registration PIN. Don’t wait until the last week before April. Faculty time is limited to office hours and scheduling is crunch time for them. If you have questions about your honors college requirements you can schedule an appointment with Kevin Berezansky before meeting with your adviser. If it helps, print a copy of the Honors College Core Curriculum to share with your adviser and explain how the CHC curriculum meets your liberal studies requirements. Hard copies will also be available in Whitmyre on the table outside Dr. Finegan’s office. First year students have no core classes to schedule for the fall as Sophomores. They also have no fine arts requirements since they are not in core. All sophomores need to schedule Junior Core HNRC 201 for fall. In addition to the Honors Core Curriculum, CHC students must complete a 3 credit Honors Elective and an Experiential Education Component to graduate. Transfer students may be exempt from some requirements. CHC students who entered the program after their first semester of college should schedule a meeting to be sure they are meeting all their honors requirements and the Liberal Studies requirements. Honors courses offered this fall can be found online at the Universitywide Class Schedule. If you are interested in applying for financial support for study or service abroad, an internship, or any other academic enrichment for the Summer or Fall of 2019, we are running another round of achievement application reviews. If you are unsure about something that interests you or just need help with elements of the application or essays, contact me at kevinb@iup.edu. 5. Resume/Vita (see Kevin) I have some good resources to help you spruce up your last effort at a resume. Priority scheduling is set for OCTCOBER 15th, 2018. Honors College students are among those with priority registration privileges and should receive a scheduling time beginning on Monday, October 15th. If you do not receive a scheduling time close to the 15th, contact Kevin Berezansky at kevinb@iup.edu. CHC students should schedule a meeting with their advisor to discuss scheduling for the spring semester and receive a registration PIN. 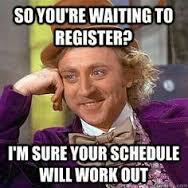 Don’t wait until the week before October registration. Faculty time is limited to office hours and scheduling is crunch time for them. If you have questions about your honors college requirements you can schedule an appointment with Kevin Berezansky before meeting with your adviser. Freshman will review the CHC curriculum, advisor meetings and a plan of attack for scheduling at the October 3rd Wednesday Workshop, from 11:15-12:05 in the Great Hall. Freshman need to schedule HNRC 102 this spring. Sophomires need to schedule HNRC 202 (science core) this spring. The following are suitable experiential education components: a graduate level course, a significant study abroad experience, a second CHC elective, an internship, an Honors independent study or Honors thesis. Honors courses offered this spring can be found online at the Universitywide Class Schedule. You can search by the Honors “Course Attribute” to see them all. Priority scheduling is set for March 26th. Honors College students are among those with priority registration privileges and should receive a scheduling time for March 26 beginning at 1 PM. If you do not receive a scheduling time proximate to the 26th, contact Kevin Berezansky at kevinb@iup.edu. Honors College administrative offices are now in Pratt 308. CHC students should schedule a meeting with their advisor to discuss plans for the fall semester and receive a registration PIN. Remember that faculty time is limited to office hours and scheduling is crunch time for them. If you have questions about your honors college requirements you can schedule an appointment with Kevin Berezansky before meeting with your adviser. Please print a copy of the Honors College Curriculum to share with your adviser and explain how the CHC curriculum meets your liberal studies requirements. If you are a junior next year you will need to schedule HNRC 201 (junior core). Sophomore Nursing and Allied Health majors also need to schedule junior core next fall to stay on track for clinicals in the junior year. There is no specific Honors Core course next fall for sophomores. If you are not a junior or senior or nursing major, enrollment is by permission only. In addition to the Honors Core Curriculum, CHC students must complete a 3 credit Honors Elective and an HNRC 499 substitution (Honors Senior Synthesis). Until we undergo curriculum revision, the following are suitable 499 substitutes: a graduate level course, a significant study abroad experience, a second CHC elective, an internship, an Honors independent study or an Honors thesis. If you have difficulty finding a relevant Honors elective and are unable to complete ENGL 202 H, you may add an H to any existing course to meet this requirement. The form Adding and H to an Existing Course outlines the process you will need to follow to request this exception. Any course may be converted with the assistance of the teaching professor and submitted to the Honors College for approval. Honors courses offered next fall can be found online at the Universitywide Class Schedule. You can search by the Honors “Course Attribute” to see them all. We are excited to announce that the fifth annual Research Experience for Summer Scholars (RESS) program will run this summer from June 4th -August 9th; uniting student, staff, and faculty researchers through stimulating social and scholarly events. The RESS program features a “Presenter Pizza Series” where we can share our research and professional experiences, professional development events, a picnic in the Oak Grove, and an afternoon poster symposium at the end of the summer. join us in this exciting 10-week summer program. Applications for RESS are available today, March 1st and can be found at RESS Application. We have attached a flyer for more information. If you or any members of your organization(s) have any questions about RESS, please feel free to contact any of our committee members. The Cook Honors College is looking for counselors to help run our Summer Honors Program (SHP). This year’s program runs from July 21st through August 4th, 2018. If you are interested in applying for financial support for study or service abroad, an internship, or any other academic enrichment for the Summer or Fall of 2018, now is the time to begin putting stuff together. If you are unsure about something that interests you or just need help with elements of the application or essays, contact me at kevinb@iup.edu. The Washington Center visits IUP! A representative from The Washington Center will be on campus for an information session in the HUB Monongahela Room on Monday, February 12 from 4:30 – 5:30 pm. All IUP students are awarded a tuition and fees waiver for a TWC internship. Additionally, PA residents will receive a $7500 scholarship to help defray the costs of attending this program. All students can also apply for private, competitive scholarships. The summer program begins on June 3 and will conclude on August 11.